Helps prevent patients from entrapment in the headboard, footboard or side rails. Also deters patients from bed exit. 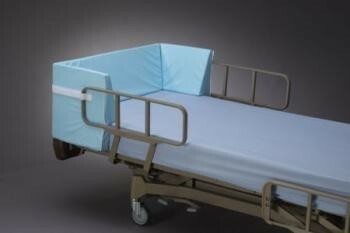 Posey Horseshoe Wedge...Helps prevent patients from entrapment in the headboard, footboard or side rails. Also deters patients from bed exit. The hook and loop flaps secure the wedge under mattress and the straps secure to the side rails, headboard or footboard. The wedge rises 250mm (10") above the mattress surface. Made of soft, durable foam and covered in wipe-clean vinyl, making cleaning easier.